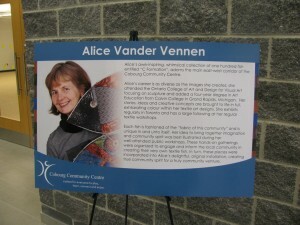 In 2011, I was commissioned to create a special public art installation for the Cobourg Community Centre (CCC), here in my hometown. The installation was a large floating sculpture of one hundred fish. The fish were sculpted in wire frames, with textiles quilted and stretched in the frames. The one hundred fish, all individually assembled, hang together like a school of whimsical, colourful fish. 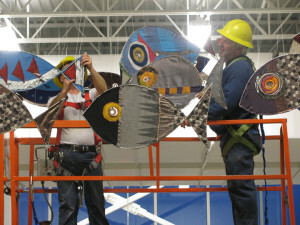 In keeping with the community concept behind the location, the fish were created in part through community workshops. Four public workshops were held at the Cobourg Public Library and at a lovely local café, where I was impressed with the large variety of ages that attended. 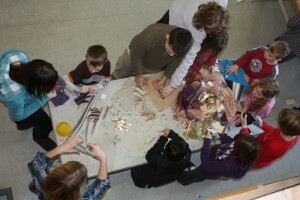 Families came in and designed a fish unique to their ages and stages. I also conducted workshops in schools, where I found working with children particularly exciting as their work is free form, and playful. One aspect of the fish sculpture was that every step was very time consuming. There was simply no way to speed up the process of working by hand — and I enjoyed that part. Each fish was hand stitched to the sculpted, then painted frame. I was especially grateful to the community that came together in the last days of the project — family helped with the hand-sewing, friends helped with the installation. 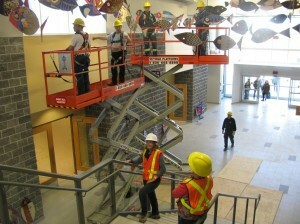 The final part of the process was hanging the fish from the ceiling of the CCC’s atrium, with a team from the town patiently waiting while I decide how each fish should be hung: where, and how high, and in which direction. 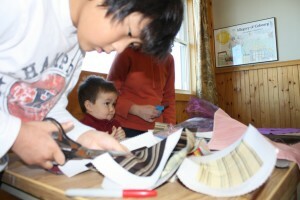 The fish, all the materials, and work, and hand stitching had all become so familiar. After spending months on the fish I knew each fish by detail. It was quite something to see all the work displayed, so publicly, visible throughout the hockey arena. 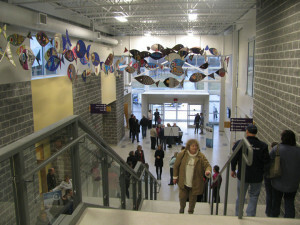 In the years since this project’s completion, the school of fish has become a well-known aspect of the CCC, and an effective visual for the character of a place meant to bring community together.